Made to withstand to rigors of a professional kitchen, this 10" Professional Nonstick Restaurant Fry Pan is ideal for frying, scrambling, sauteing, browning and searing your favorite dishes. Made from high-grade aluminum alloy 3004, the heavy-gauge construction provides quick and even heat distribution. 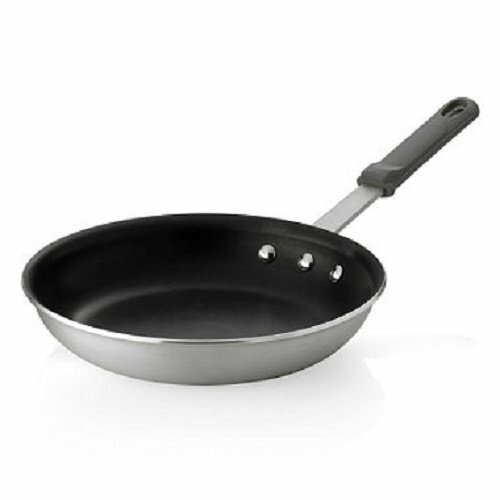 The pan features a satin-brushed exterior finish, a flared rim, and a high-performance reinforced nonstick interior coating that allows for easy flipping and stirring. The cast stainless steel handle features a removable silicone sleeve that provides heat protection and flexibility for use on cooktops and within the oven. The pan is oven safe up to 500 degrees Fahrenheit (260 degrees Celsius) without the silicone sleeve, and up to 400 degrees Fahrenheit (204 degrees Celsius) with the silicone sleeve. This NSF-certified pan is compatible with gas, electric and ceramic glass cooktops and is dishwasher safe. Proudly made in the USA with imported components.